Synthesizers are instruments that generate sounds electrically rather than mechanically. The sounds produced can be manipulated to provide you an unlimited number of sweet & saucy sonic solutions. The real value of the synth is that you can produce almost any instrument sound from a single source. Add violins, trumpets, timpani, bass guitar, barking dogs, air raid sirens... with ease. There are no limits to the possibilities. Don't leave these bad boys out of your studio rig - it just wouldn't be right. You can add these via a MIDI Interface, whether it be a stand-alone unit or part of some other hardware (such as an audio interface), or with the line outs to send your signal directly to your preamps. Including MIDI allows you to have full control over your sounds with just a few simple adjustments. Don't worry if you're not familiar with MIDI yet, you can check here to answer all your questions. As far as accessories go, the only one that's essential in my mind is some sort of stand. Get something that will be stable. That's about it. A cheap keyboard stand will remind you with each shake rattle and roll about how you should have gotten a better one. I personally have owned 4 stands... each one a bit beefier than the one before it. Don't be like me. Get a sturdy one right off the bat. Synthesizers come in 2 flavors, hardware and software based. 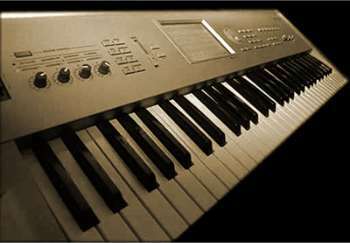 Since the software based synth does not have a physical input (like the keys of a typical digital piano) you will still need some kind of MIDI Controller to use as an input. This can get confusing so let me make sure I'm being clear. Softsynths exist only in the virtual realm of your computer. They can be plug-ins that are included with your audio recording software or sold separately. So to play a softsynth you need both the physical keys to trigger the sounds (hardware), and the electronic definition of the sounds themselves (software). A traditional hardware synths is different because in addition to having a MIDI I/O that can be used to trigger softsynths, it also has a dedicated line out that can be used to drive speakers. Hardware based synths also have their own on-board banks of sounds that you can trigger within the unit itself. As a piano player myself I'm a bit partial to hardware synths, but MIDI controllers & softsynths are probably the least expensive way to expand your sonic horizons. That's my synthesized story and I'm stickin to it.